It took 3+ hours of my life to cover the Slow Fly wing. I’m going to do the sport wing in Solite (Nelson Litefilm) because I do not want to work with this stuff again. Its an exercise in frustration. The tape sticks to itself, it sticks to you and everything else. It rips very easily once you start to cut into it. It sticks to the scissors and the knife to stop you from making a clean cut. It refuses to go around corners and will peel away from sharp bends. Its virtually impossible to cover a convex shape unless you use a million little strips. I guess its only saving grace is that its cheap, $3 per roll. Just one roll would cover the entire airplane but I got 4 to have some different colours to work with. You also need 3M77 adhesive spray, that will lighten your wallet by another $16. Admittedly though Solite would be more expensive. You need tools, an iron and a heat gun. Each roll will set you back about $11. I have read that Solite is very sticky too, who knows, it may be just as bad. So with the wing finished its on the final assembly. Pushrods, soldering connectors, installing radio gear and making up the landing gear, set the CG, charge, test… go fly! And the wind is blowing, from the North West at between 4 and 8 mph in gusts. I was nervous about the wind, these were not ideal conditions. Still it was better than most days, it always seems to be windy here. The field is deserted and it hadn’t been yesterday and thats a very good thing. I put the wing on the Magpie, turn on the transmitter and connect the battery. Even if I don’t fly I should at least do some glide tests to check the center of gravity, right? I did a range check and then gave the plane a gentle push. Too gentle. The second time, with an even shove the Magpie glides smoothly about 10 feet and comes to rest flat on the grass. No damage, the controls seem to be working properly and the CoG is just fine. I throttled up the motor and held it at full throttle for 10 seconds and then shut it off. I felt the motor, it felt warm. It smelled of that burnt electric smell but all seemed to be in working order. I hoisted the airplane over my shoulder and held it ready for launch. I throttled up maybe 1/2 throttle, the airplane tugged at my arm and wanted to go free. My throat was dry. “Launch the plane, right hand to the stick… Launch the plane, right hand to the stick…”, I thought it over in my head. Go! The plane leaves my hand and goes straight forward. Right hand on the stick. Its turning left into the wind. Its done a complete 180. Now its tracking cross wind towards me, my car and the trees at my back. Gotta think fast. I cut the throttle and glide in for a smooth landing about 10 feet from the trees. My heart was beating a mile a minute, I did it, success! I got 7 more flight in before 6pm on a single charge. No crashes, bad landings not even a broken prop. Each flight got longer and more controlled as I got more confident. I did lazy eights, a couple of loops, then an outside loop I even flew inverted for a bit. In short I had a blast! I would like to thank Roman Michael MÃ¶ller for their work on Flying-Model-Simulator. Without 15 hours of time spent in their Sim I know things would have gone much worse. I worked on finishing construction of the Magpie most of the day Saturday. This basically got the airframe to the point where all parts are ready to be covered. This includes the Sport Wing that is staying one step behind the slow flyer wing. I used a different technique for applying the strapping tape to the sport wing that worked well. Join the wing as before (I used 5 min epoxy this time). Next split the wing cradles at the front into a top and bottom halves. 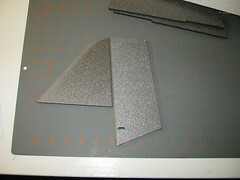 Take some 150 grit paper on a sanding block and sand down the ‘speed bumps’ that remain on the wing cradles from where the groove is cut into the wing for the strapping tape. 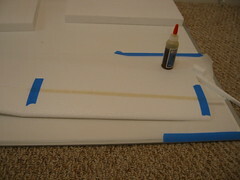 Cut both pieces of the strapping tape and apply them to HALF the wing, top and bottom. tape the ends down if necessary. Wrap the wing in a length of parchment paper to prevent it sticking to the cradles. Put the wing in the cradle and weigh it down. Don’t be afraid to use lots of weight, I used a sheet pan to help spread the weight out evenly. Wait for the glue to cure and then repeat on the other half of the wing. For the empenage (thats the tail feathers) I stuck to the directions for the most part. The dowel that came with the kit was a bit bent so I swapped it for a carbon fibre rod of the same diameter. For the rudder and vertical stab I beveled the edges into a point. For the horizontal stab/elevator I used a single bevel as suggested in the instructions. Make sure you use a fresh blade for making the bevel cuts. Cut against a straight edge with the knife pointed ‘in’ towards you. 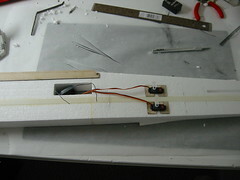 I added the wing saddles and servo plates to the fuselage. I moved the servo mounts about 3 inches forward of the location given in the instructions. This was something of a judgement call. Most people on RC Groups note that the model comes out tail heave. Also I would have needed servo extensions (an item missing from the required parts list!) to put the servos that far back. Whenever you move a servo further from the control surface you increase the amount of flex in the pushrods. To counter this you need to stiffen them or add guides. The elevator pushrod travels far from the fuselage so guides would need to be pretty big. I’m leaning towards using bigger diameter carbon fibre rods instead. The manual calls for applying some thin plywood planks to the top-center of the wing. 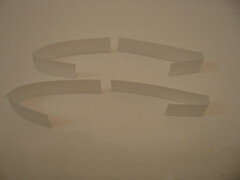 These take the load of the rubber bands and stop them from being crushed. I replaced this with some extra strapping tape that I bent to fit around the leading and trailing edges. I’m not sure how this will work out, they may be too narrow. Work with a kitchen timer. Set it for 5 minutes and start the countdown before you start mixing. Mix vigorously for 30 seconds. Buy a bag of cheap Popsicle sticks for mixers/applicators. Try the crafts section or a crafts store. Apply as little epoxy as possible, scrape off any excess. Epoxy is heavy and it won’t penetrate. At 2 minutes to go do not apply any more epoxy from this batch to the work, its too late. 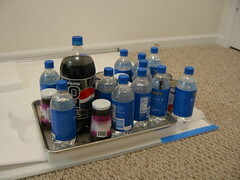 At 1 minute to go clean any epoxy off your hands with rubbing alcohol. Finally as always, do a test bond before you do the first piece of your airplane. For jobs bigger than a couple of square inches (like wing strapping) I would go with a 30 minute epoxy so you have more time to get things in position. ‘Wing’ Tape is actually Acrylic packing tape. Its thin, light, sticky and very frustrating to work with. You don’t really get a chance to reposition this stuff if you put it down wrong. I actually broke off part of the rear fuselage trying to reposition some tape. It doesn’t do compound curves well. You have to make lots of small cuts. I did the fuselage first and it took nearly 3 hours. By the time I was don’t the adhesive spray was starting to loose its tackiness. I don’t want to do that again so I’m trying something different on the wings. I basically stopped working on the model on Sunday because I didn’t want to mess with the tape anymore. The battery and charger showed up today. I chose, a Thunder Power Pro-Lite 2100mah 3S pack that weighs in at 5oz. the ’3S’ part means thats its 3 cells in series, this is also written as 3S-1P to denote that its one bank of series cells with no other bank in parallel. 3S-2P would be 2 banks of 3 cells in series, joined in parallel, confused yet? 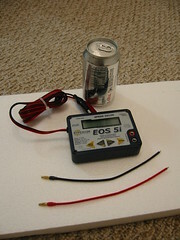 The charger I got is a Hyperion EOS 5i. I have about zero fear of taking things apart so I took a peak inside. It looks well built, the case is all aluminium and the buttons are sealed. There are 2 black heat conduits of a material I can’t identify that connect to the back plate of the charger to what I assume are mofsets (voltage regulators). 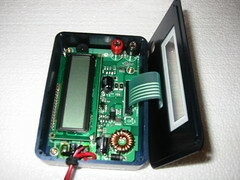 There is some sort of thermal interface material between the conductor and the back plate. I didn’t want to break the interface in case it is a pad so I didn’t take the back plate off. Removable input cables would have been nice. I could have used a different set to connect to a PSU and saved the alligator clips for charging from a field battery. I don’t like alligator clips or bare connectors on a cable, they make me nervous. I will have a full weight report at the end of the build. 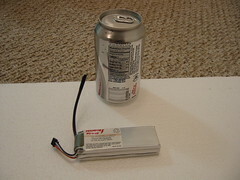 The Instructions claim the final weight will be 12oz without the battery. Right now its up to 5.6 ounces. The running gear will add another 5oz so its going to be tight. Make sure you get the strapping to lay flat on your work surface before you apply it. It it wont lay lay by itself its going to have enough force to curl away from the foam. Find the middle of the strapping and crease it! This stuff doesn’t go around corners very well so you have to bend it where it turns at the centre of the wing..
You need tape to hold it down, particularly if you use Polyurethane glue. However, you can remove the tape once the glue had dried. It won’t adhere well because there is no adhesive on the rest of the foam. You can then sand over the strapping area for a really smooth finish. Don’t forget to sand the tape. I’m not sure Polyurethane is the best glue for this and it tends to push the strapping away from the foam as it cures. The tape I uses didn’t adhere well enough to keep it held down. On the underside of the wing I used too much glue and it bubbled up in some places. Luckily I caught it and pushed it back down before it cured that way. By the time I did the fuselage I had it down. The only different with the fuse is that there are no channels cut into it to guide you. On the up side you can sandwich it with anything moderately heavy you have lying around to make a tight bond. I’m gonna play with this technique when I do the sport wing. I think with a bit of parchment paper and the wing saddles you could get perfect strapping tape application, more on that later.